This is a complex Late Iron Age to Roman site dating mainly from the 1st century. A large rectangular enclosure is visible on aerial photographs. The site was excavated in 1874 when a railway was being constructed over the site, and two timber-lined ritual shafts or wells were found. The shafts contained a large amount of Roman pottery, with many complete vessels, dating to the 1st century. Building materials also show that there was a Roman building within the enclosure. Roman coins, brooches and other metalwork have been found by metal detecting. The original purpose of the site is unclear, but it is close to the Panworth Ditch and a nearby Roman road (NHER 1082), suggesting that it may have served a military purpose. However, the site could also have been constructed for purely ritual purposes. Early Roman rectangular enclosure, probably ritual rather than defensive. Iron Age metalwork and Middle Saxon pottery also from site. 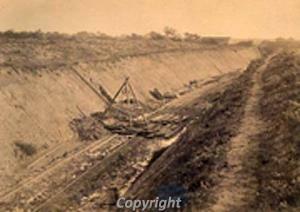 Railway cut through site. Excavation of ritual shaft. See (S1). Fieldwork produced Roman sherds and building material. Casual find of Roman sherds and building material. Reported find of Roman floor, sherds and coin. Excavation across ditch of enclosure by Norwich Research Committee. Casual find of building material, sherds and ironwork. Casual find Roman objects and Middle Saxon pottery. Air photograph of Roman road. Fragment of Roman horse statue found with metal detecting. Report of illegal excavation. Roman statue, pottery and lamp. Metal detecting finds of Iron Age and Roman coins and metalwork, also flint. Iron Age or Roman head found. Iron Age coin found, details unknown. 1989. Finds in fieldwalking and metal detecting. Roman sherds and metalwork, post medieval metalwork. August 1991. Metal detecting finds. Roman coins, pin and brooch. See file for full details, photographs, site notes of early excavations, draft copy of (S2). D.A. Gurney (NLA), 20 August 1991. Cropmarks still visible (earthwork enclosure showing as cropmarks). Cropmarks of Roman enclosure still visible. Before July 2001. Field walking. Large number of Roman sherds. Roman brick/tile, medieval roofing tile. A. Rogerson (NLA), 21 December 2001. --- Photograph: PY 12, 16, BPK 1-12 (coins). --- Aerial Photograph: Edwards, D.A.. 1995. TF9105/A - D.
--- Aerial Photograph: Edwards, D.A. (NLA). 1996. TF 9005AE - AG. --- Aerial Photograph: Edwards, D.A. (NLA). 1996. TF 9005AH - AR. --- Aerial Photograph: CUCAP. TF 9005AS-AV. --- Newspaper Article: Eastern Daily Press. 2010. Norfolk's treasures revealed.. 16 September. --- Archive: Clarke, R. R. and NCM Staff. 1933-1973. Norwich Castle Museum Record Card - Roman. Ashill . --- Article in serial: 1963. Archaeological Discoveries in Norfolk, 1961. Norfolk Research Committee Bulletin. Series 1 No 14 (for 1961 and 1962) pp 1-3. pp 1-2. <S1> Article in serial: Barton, T. 1879. Roman Discoveries at Ashill. Norfolk Archaeology. Vol VIII pp 224-230. <S2> Monograph: Gregory, A.. 1977. The Roman Enclosure at Ashill.. East Anglian Archaeology. Vol V, p 9. <S3> Article in serial: 1986. Britannia. Vol XVII, p 268. <S4> Illustration: Gregory, T.. 1980. Drawing of an Iron Age copper alloy terminal.. Film. 2:1. <S5> Illustration: Gregory, T.. 1980. Drawing of two Iron Age copper alloy bosses.. Card. 2:1. <S6> Illustration: Gregory, T.. 1980. Drawing of an Iron Age copper alloy La Tene I strip-bow brooch.. Paper. 2:1. <S7> Illustration: Gregory, A. 1980. 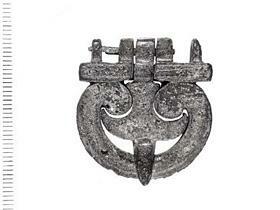 Drawing of a Roman copper alloy buckle pin.. Card. 2:1. <S8> Illustration: Gregory, T.. 1980. Drawing of a Roman copper alloy elliptical plate with rear studs.. Film. 2:1. <S9> Illustration: Gregory, T.. 1980. Drawing of a Roman copper alloy elliptical plate with rear studs.. Film. 2:1. <S10> Illustration: Gregory, T.. 1980. Drawing of a Roman copper alloy elliptical plate with rear studs.. Film. 2:1. <S11> Illustration: Gregory, T.. 1980. Drawing of a Roman copper alloy hook and eye bracelet. Film. 2:1. <S12> Illustration: Gregory, T.. 1980. Drawing of a Roman copper alloy plate with peltate head.. Film. 2:1. <S13> Illustration: Gregory, T.. 1980. Drawing of an undated unidentified object.. Film. 2:1.